I have many beet soup recipes on this site, but I don't have one for botwinka (boht-VEEN-kah) or spring beet soup I adapted this recipe from one by Ola Klimek in All Recipes magazine (April/May 2015). Klimek says, “[Polish] winters can be long and harsh, so we like to celebrate the arrival of spring by cooking with the young vegetables of the season. Botwinka is made with young, spring beets and their green tops that have a spinach-kale flavor. In addition to being a taste sensation, the soup is packed with antioxidants along with vitamins A and C, she says. Trim greens and stems from beets. Thoroughly wash and chop greens and stems. Peel and cut beets into 1/2-inch cubes. Bring beets, chicken broth, leeks, celery root, carrots and parsnips to a boil in a large pot. Add potatoes, reduce heat to medium-low, and simmer until vegetables are tender, 10 to 12 minutes. Stir beet greens and stems into the soup and simmer until greens and stems are tender about 5 minutes. Mix sugar, lemon juice or vinegar, and salt into soup. Stir sour cream and flour together in a bowl until smooth and thickened. Temper the sour cream by whisking 1 cup hot soup into sour cream mixture until smooth. Return sour cream mixture to soup and stir. Simmer soup until thickened slightly, about 1 minute. Add dill and remove pot from heat. 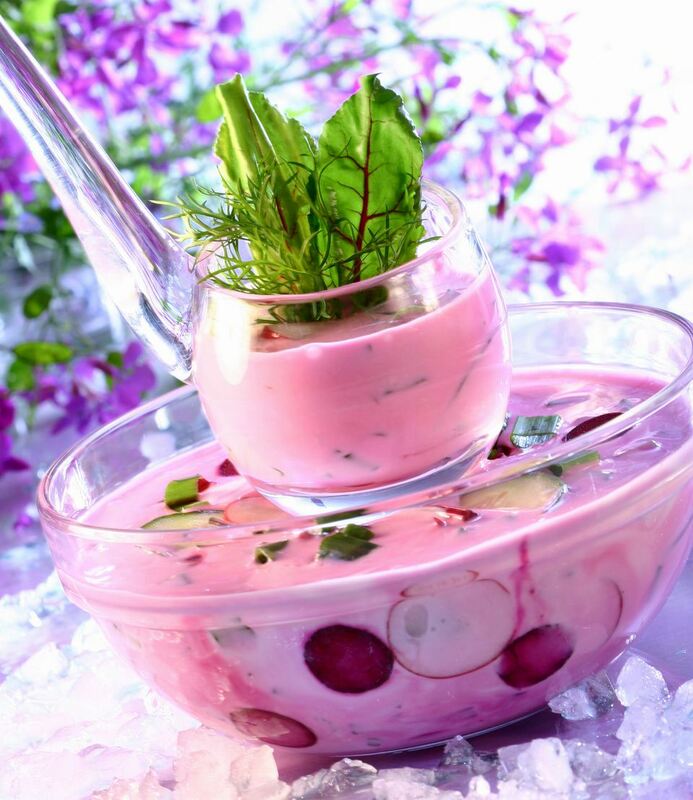 Ladle soup into serving bowls and arrange 4 egg quarters and sliced radishes in each bowl. For a cold, creamed soup, let soup cool thoroughly and add half-and-half and chill until ready to serve. Then place quartered eggs and radish slices in each bowl or in the soup itself and serve ice cold. So refreshing! Source: Adapted from a recipe by Ola Klimek in All Recipes magazine (April/May 2015).